I apologize for posting this so late (five months, to be exact)! It was such an exhaustive meal that I never got around to fully documenting it all! 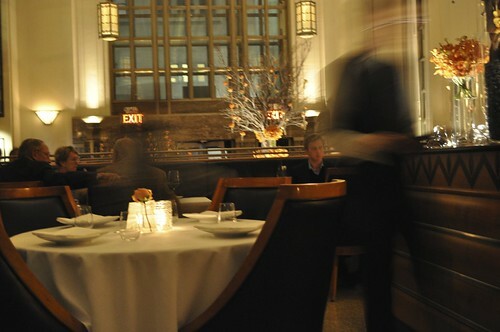 It is one of my favorite restaurants of all time, so I definitely wanted to squeeze this in as soon as I could, so here it is--dinner at Eleven Madison Park during the Fall of 2010! Shortly after my trip to Alinea, Lisa and I paid a visit to our all-time favorite restaurant, Eleven Madison Park (aka EMP). We made the reservation (four-weeks in advance, of course) primarily because of the new changes highlighted in the Times's Fall Restaurant Preview back in September. It discussed the "minor changes" (though to me, it was seemingly more drastic) to EMP's menu and restaurant seating/layout in order to hone the experience at the restaurant as well as its philosophy (I'll explain this part later during our kitchen tour). 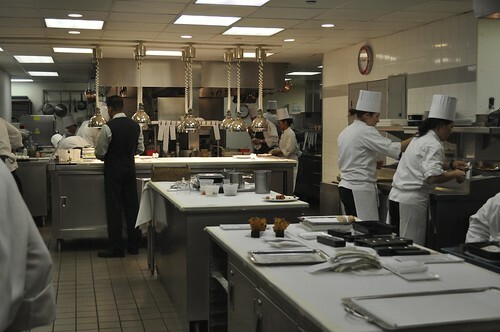 Chef Daniel Humm, and EMP's general manager, William Guidara, collaborated to "rethink" the restaurant, consisting only of tasting menus (bye, bye a la carte) and eighty dining room seats (eek!). 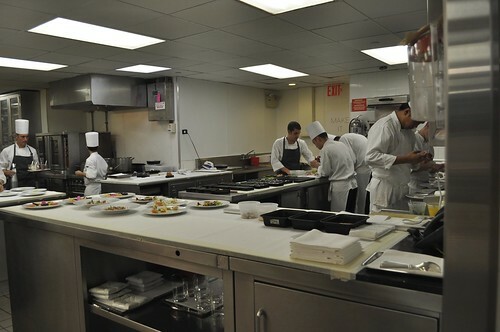 The reduction of total seating from 114 was entirely due to the conversion of the restaurant's former back room into a "pantry" (photograph will be seen later on) to permit line cooks to join the restaurant's servers, in a way, to bridge the kitchen with the restaurant's patrons. The other major change was to the restaurant's menu, which I will discuss soon. 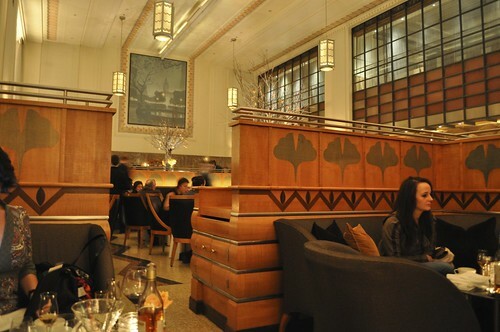 Inside the new Eleven Madison Park. 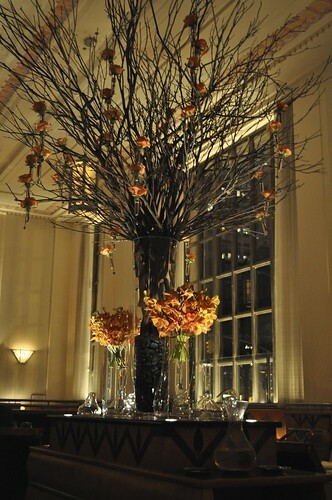 I've always loved the restaurant's main centerpiece, placed at the dining room's center. It is poetic and has an understated elegance. This being our fourth visit (Lisa and I have kind of dubbed Eleven Madison Park to be our restaurant, the way old friends may say), we knew exactly how much our stomachs could handle at EMP. From our first visit through our most recent visit (for the summer menu back in August), we've had the same captain for each and every one of our meals (her name is Alexandra). She has always been absolutely wonderful to us--it was definitely a perfect match between guest and captain. She has been very helpful with any questions we have about the menu and the restaurant during our multiple visits. Her demeanor is certainly her best quality--you can tell she is happy to be there and excited that you could join Eleven Madison Park during the said evening. After our first visit, Lisa and I left our contact information with the restaurant as we were so impressed with the level of impeccable service and hospitality. A week or so later, we each received a thoughtful note from Alexandra and the restaurant, thanking us for our visit, enclosing detailed descriptions of the wines we had that evening. Up until that point, I had never had that level of guest service from a restaurant as high caliber as Eleven Madison Park. It was a lovely and refreshing surprise. Ever since then, Lisa and I have kept in contact with the restaurant, Alexandra, and one of the general managers, and we know where we'll be welcomed back with open arms if we're ever looking for a spectacular place to wine and dine! Unfortunately, Alexandra couldn't make it in that evening in October, but she left us in good hands with another captain named Kevin. Anyways, Lisa and I decided on the four-course dinner (with Lisa splurging a little on the white truffle supplement to her portion). We opted not to do a formal wine pairing because we find it better to engage in conversations with the restaurant's sommeliers (who are very friendly and informative) for the best glass of white and glass of red (what Lisa and I usually do) for the evening with our dinner course selections. 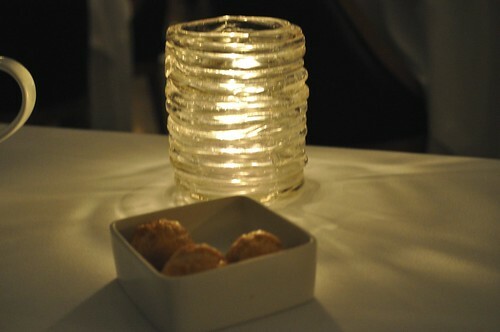 As always, the meal began with a few gougères, which are savory pastries (made from light pastry dough called pâte à choux) with cheese. Creamy and savory, indeed--always a delightful way to start a full-course dinner. Our captain started us out with a series of interesting hor d'oeuvres. 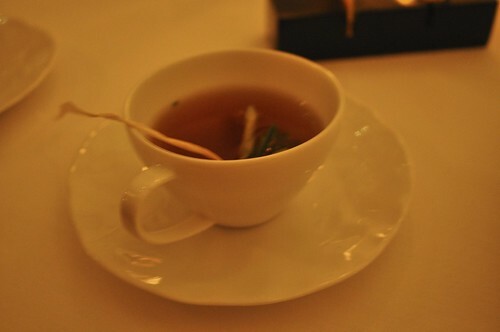 The first hor d'oeuvre that evening was a baked potato tea with roasted sage and thyme. This reminded Lisa and I of the Chinese-style soups (usually broths flavored with different herbs, vegetables, and roots) we grew up with at the dinner table--flavorful and simple. This was the potato lavash (lavash is a thin Middle Eastern cracker bread) served with a chive butter cream cheese. It reminded me of a fancier version of potato skins, the kind typically listed as bar fare, but in the style of a Pringles chip. Nice crispiness and creamy from the cream cheese. 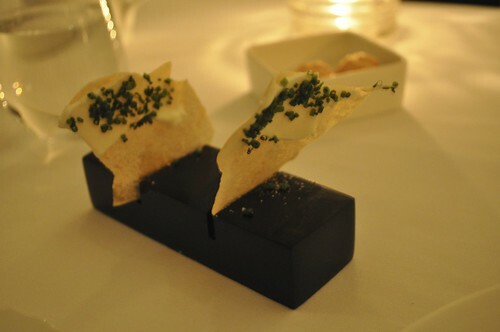 As a side note, the blocks of black resin and the resulting hor d'oeurve plating on these blocks reminded me a lot of the gadgetry and servingware (but not nearly as wacky or avant-garde) found at Chef Achatz's Alinea. It's nice to see a restaurant that may have been designated as one associated with an older crowd embrace creativity and modern plating as Alinea does. 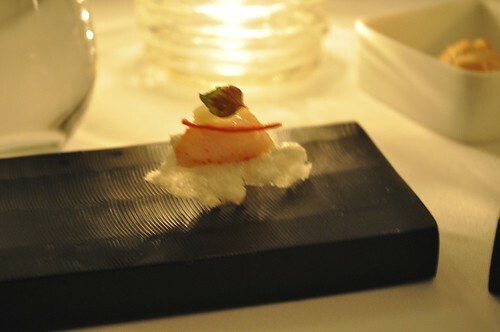 The next hor d'oeuvre was hamachi on a rice cracker. I think the hamachi (i.e., yellowtail fish) was prepared ceviche-style, which we found this to be a little too citrus-y. 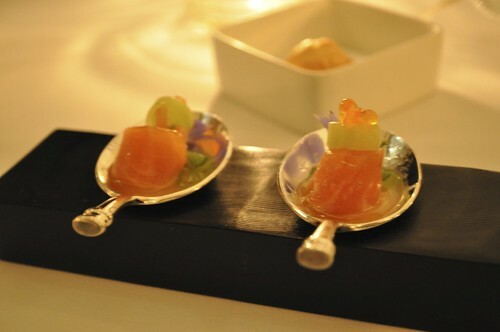 This was the salmon with cucumber and salmon roe. We liked the simplicity of this hor d'oeuvre, as its taste resembled the items found on a bagel with lox. 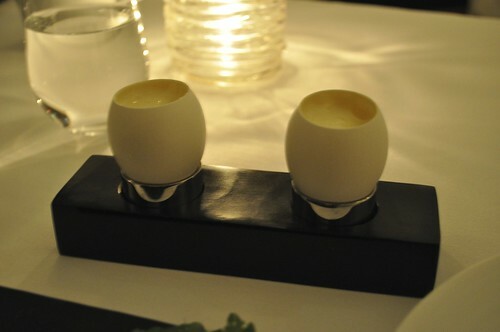 This unusual hor d'oeuvre was smoked sturgeon sabayon with chives at the bottom. The flavor was interesting, but we found it to be too concentrated overall. Perhaps we needed to mix the contents slightly to spread the strong taste around with the other ingredients. 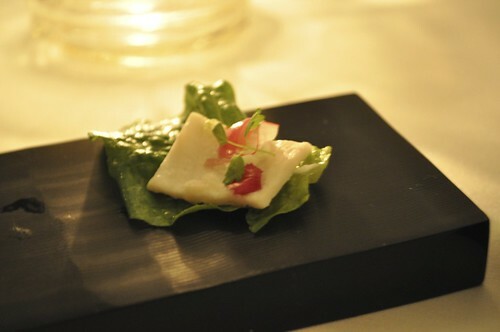 Alongside the sturgeon sabayon was a "salad" course: smoked sturgeon with radish and chili on baby lettuce, making for a light, miniature salad as a starter. A lovely surprise before the main courses began, this was the snow course with apple (green), foie gras (light portion), and salted caramel (dark portion). Alexandra had told Kevin that she wanted to make sure we didn't "miss" this awesome course. Kevin instructed that we taste each shade of snow separately before combining them to make sure we found their flavors be favorable. The verdict? I came out right and said it tasted like Cinnamon Toast Crunch cereal with some Apple Jacks mixed in. Lisa laughed and agreed that there wasn't a better way to describe this course. 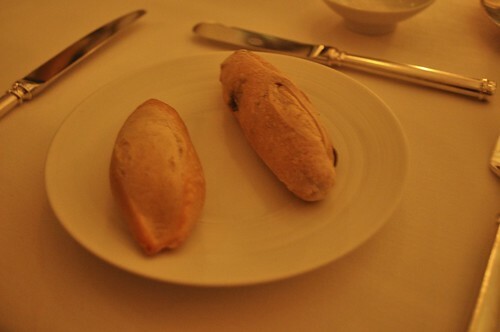 They didn't skimp out on the bread--on the right, a classic miniature French baguette, and on the left, a Picholine olive bread. 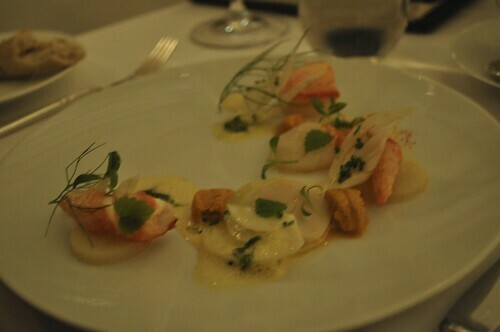 Lisa had the sea urchin with lightly steamed lobster and scallops alongside raw and cooked fennel. Sea urchin is one of her favorite foods, so having it mixed in with soft scallops and lobster meat along with the crunch of fennel made for a lovely first course. 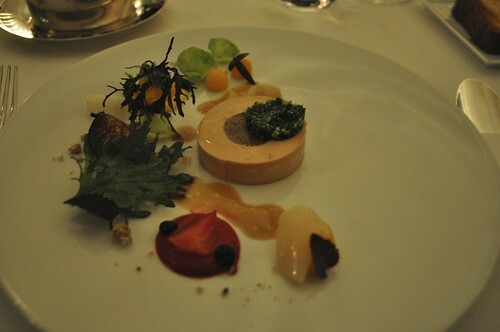 As my first course, I went with the foie gras with autumn vegetables and fruit alongside juniper brioche, candied items that escape me now, and cured pork. The brioche was toasted to the right temperature, resulting in loose, crumby bites. The foie gras paté spread on each side was rich, delicious, and filling, complementing the juniper flavor of the brioche. I also noticed the plating of each of the first course dishes were arranged in a curve--not sure if it signifies anything, but I thought it'd be worth pointing out. 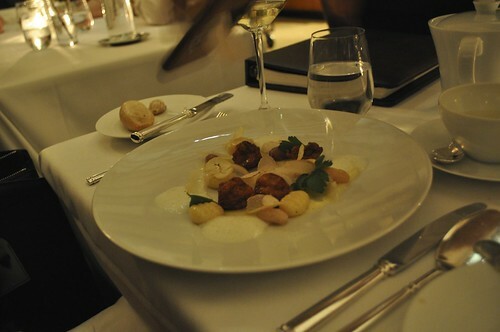 Lisa's second course was the white truffle with sweetbreads, gnocchi, and chestnut Parmesan foam. 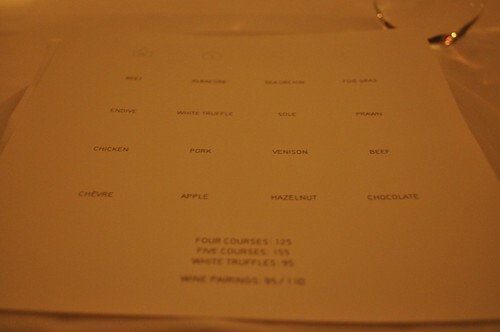 This was the course for which the white truffle supplement was added. I believe a line cook came over to our table to show us the white truffle and shaved it over Lisa's plate until it met the allotted amount per supplement, which to Lisa's dismay, was not enough for her (but I don't think any amount of truffle shaven over her plate would've been enough, being the truffle fanatic she is). I tried a bite or two with a piece of shaven white truffle, and I thought the truffle's flavor really brought out the meatiness of the sweetbreads and starchiness of the gnocchi. Lisa seemed disappointed, but I didn't think it was a letdown! 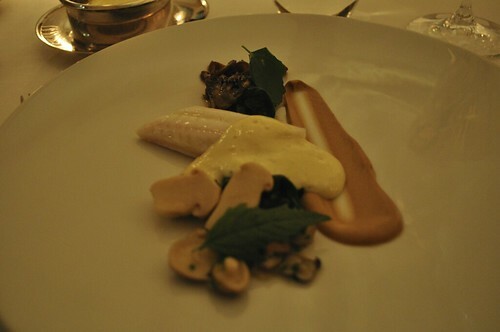 For the second course, I had the sole with assorted wild mushrooms and a Shiitake autumn mushroom sabayon. The sabayon was definitely my favorite part of this dish (surprise, surprise), which meshed well with the buttery texture of the sole. 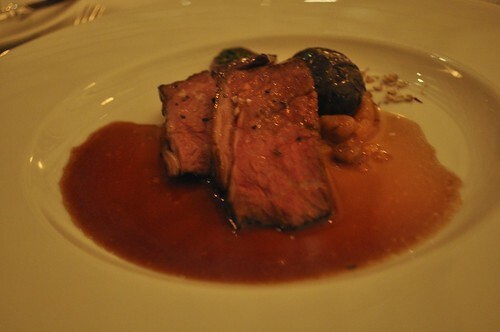 Lisa went with beef as her main course, which was braised short rib with a bone marrow Bordelaise sauce alongside oxtail, onions, and shallots. And yes, it was as awesome as it sounds! I mean, can you really go wrong with combining bone marrow with the savoriness of short rib meat, the biting, sweet flavor of shallots and onions, and the fatty goodness of all bone marrow? That Bordelaise sauce was to die for! I wish I could go back for more--I definitely stole a few more pieces than I should've been allowed from Lisa's side of the table. Oops! I selected the venison, which was a roasted loin with Brussel sprouts, anjoy pear, and bacon panna cotta as my third course. I thought Chef Humm highlighted many of the earthy ingredients that the autumn season brings forth. 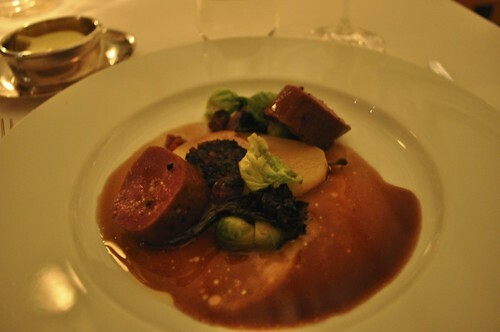 The anjou pears added an otherwise sweet quality to the venison, whose meat was very tender and soft. 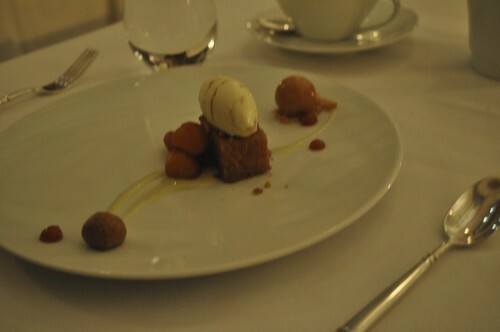 Lisa went with the apple course for dessert with toffee cake and roasted caramel apple. 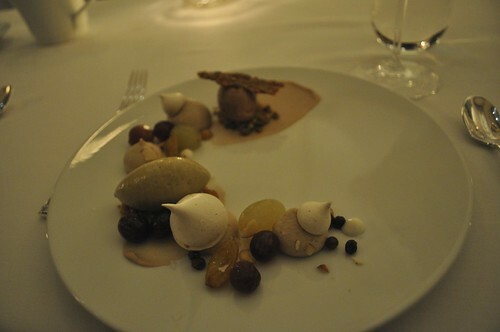 For dessert, the last course, I had the hazelnut course with pistachio ice cream, chestnut purée, and variety grapes. 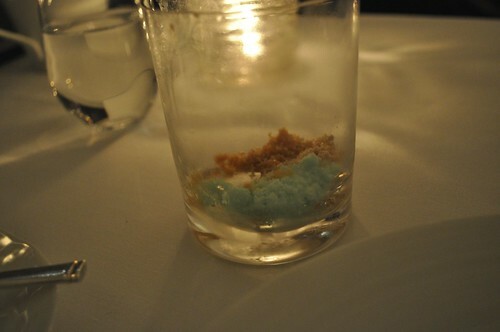 After having all these courses, I totally forgot to take a photo of the malted milkshake which was an olive oil emulsion with salt and pepper, malt ice cream meringue, and yogurt. This was a very interesting combination, as the olive oil kind of acted as the subtle enhancer of the entire dish and the salt and pepper acted as the punch! It crossed the territory of becoming a savory (as opposed to sweet) dessert. Definitely a favorite for me! 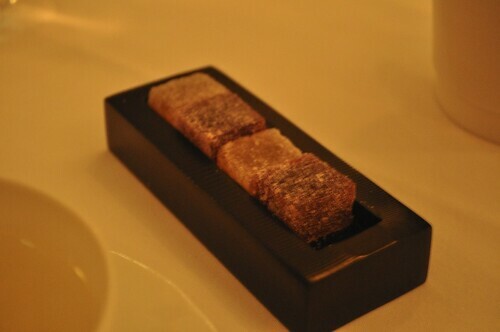 To start the round of petit-fours was the pate de fruit of passion fruit and raspberry. Typically, before the renovation, these would be the "take home" treat, placed nicely in cleverly designed Eleven Madison Park packaging. It was nice to see these outside of the gift boxes! 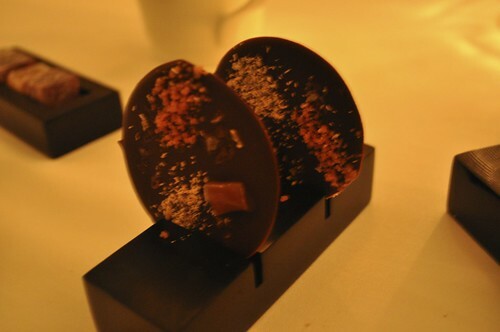 The next was the chocolate bon-bon with three types of caramel and three types of salts--a nice saltiness to the caramel and chocolate. 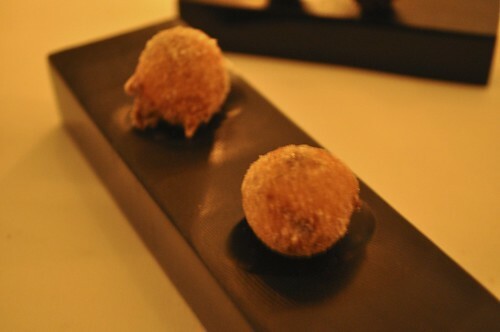 These were the doughnut and coffee beignets--just like you would have at a diner or bakery on any given morning. 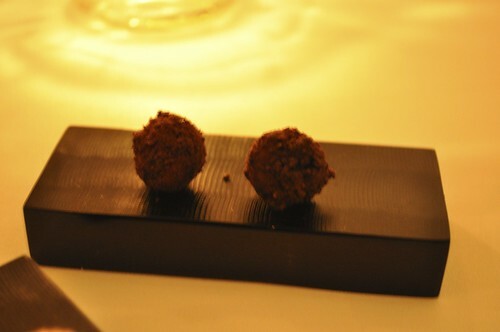 The last of the desserts consisted of chocolate truffles with chocolate truffle ice cream--very rich! 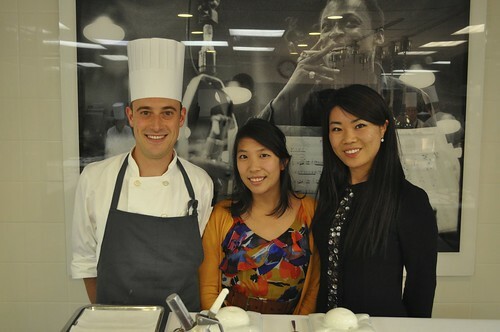 Shortly after dessert, one of the general managers, Daniel, brought us on a tour of the "new" kitchen area. 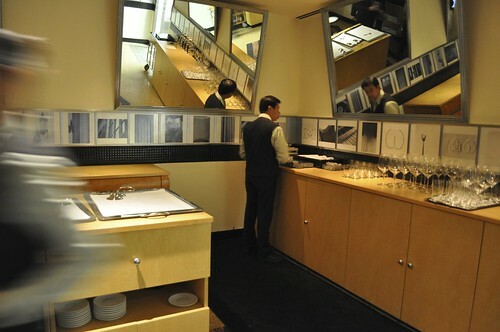 This is the former dining room area that was converted into a "pantry"--very organized and neat! 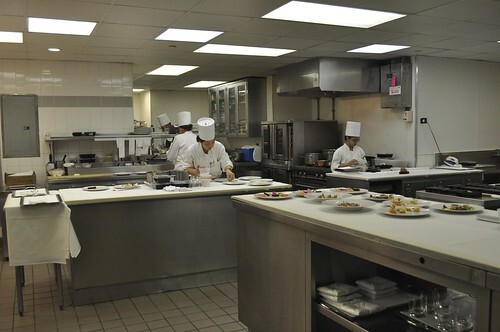 Upon our entering the actual kitchen area, the general manager told us about Chef Humm's equating culinary arts with the art of jazz music. Being so, the words framed up here are the eleven (haha, for Eleven Madison Park) words the kitchen (and the restaurant as a whole) embraces, drawing influences from the nature and heart of jazz (especially being cool and spontaneous)! While on our tour, the kitchen had a lovely surprise for us. One of the chefs prepared each of us a deconstructed cocktail, on the spot--so very cool! 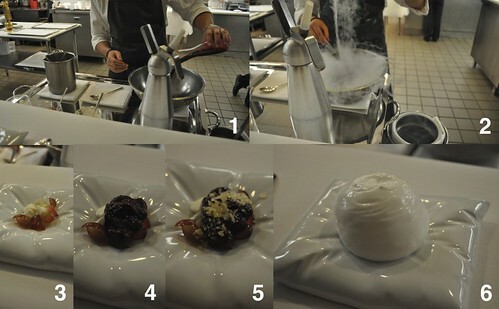 First (see 1), he poured the black currant purée into a stainless steel bowl, then added liquid nitrogen (see 2) to turn it into a colder solid (almost like a sorbet). He then put some grapes and lemon meringue onto a "cushion dish" (see 3) followed by the solidified black currant purée (see 4) sprinkled with the extra "secret ingredient"--their response when I asked what that was (see 4). The final touch was added with a champagne foam (see 6). Then I realized--they were making us a kir royale in the most unconventional way I've ever seen! After having one bite, I immediately called out the secret ingredient--Pop Rocks! The champagne foam and the black current sorbet acted as the sparkling wine and the crème de cassis of the classic kir royale while the Pop Rocks acted as the bubbly carbonation of the sparkling wine. So incredibly clever and delicious! Hands down, the best part of our entire meal for me! Lisa suggested we get a photo together with the chef who created our deconstructed cocktails! View of the kitchen as we were leaving. 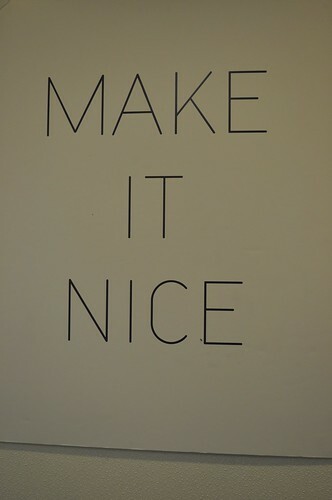 This was hanging on the other side of the kitchen as a nice and minimalist reminder to present everything nicely. I thought it was a nice touch. After our tour, the general manager brought us to the "digestif" area (not sure what the restaurant formally calls it) for its guests to enjoy a drink or two before concluding the meal and departing. As I forgot to snap a photo of the homemade pear-infused grappa, I've included a photograph I had taken of it during my last visit (before this one, of course) to EMP. I think there's just two words for this--powerful and strong. I would only advise sips (if you could take down more, I'd be both concerned and impressed). It is definitely an acquired taste. You also may be wondering how they got that pear inside this narrow-necked bottle. 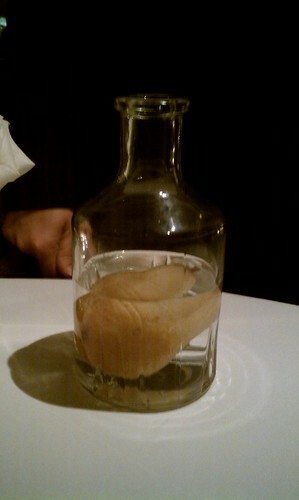 They actually grow the pear directly inside the bottle--how amazing is that?! You can smell the pear wafting in the air when sitting close to the bottle and to the glass into which it is poured. Findings: The level of impeccable service--both welcoming and resourceful--is what we look forward to during each and every one of our visits to Eleven Madison Park. I have never been to a restaurant thus far where the service has showed this much enthusiasm and excitement for the restaurant's patrons to be there--whether there's an actual reason to celebrate or not (though, any visit to EMP is worth celebrating!). Lisa and I feel like we're part of the EMP family every time we're there, and it's a feeling that just makes you giddy, smile incessantly, and excited to be there. In fact, now that the size off the restaurant has increase significantly, it has become an even more intimate space and dining experience, which I personally find endearing and more relaxing, while the chatter is still energetic, just at a lower register. I was so overly excited when Chef Humm came out to greet us (he told us he wants to make it a point to make sure to greet every one of the restaurant's patrons every night when he can, as eating in his restaurant, to him, is like eating at his actual home) that I forgot to ask someone to snap a photograph of us with him! Next time, for sure! He's always very soft spoken and thoughtful with his words--I really admire that in a chef. I'm liking the new changes to the restaurant very much (I'm sure it's changed a lot more since this visit in October), and I'm dying to go back to see what Chef Humm has up his sleeves for the Spring season. The new philosophies embraced by the restaurant as well as the inspiration drawn from the genre of jazz has promising things in store for Chef Humm and EMP. We've done the kitchen tour during each of our past visits, and each time, without fail, there are just more and more surprises! I look forward to our next visit--perhaps this Summer--to our favorite place to relax and catch up. 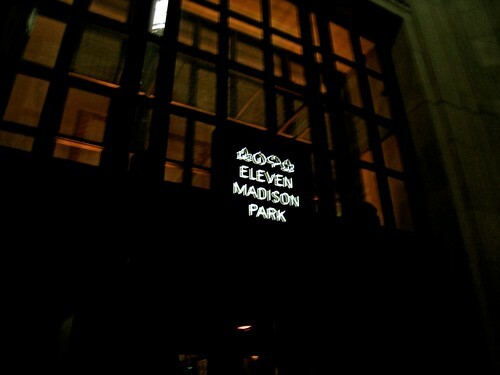 Please pay a visit to Eleven Madison Park when you can--I promise you won't regret it! Price point: $125 per person for a four-course prix fixe tasting, $95 for white truffle supplement.